The teenage boy band TFBOYS, also known as The Fighting Boys, is managed by Chongqing-based entertainment agency TF Entertainment. 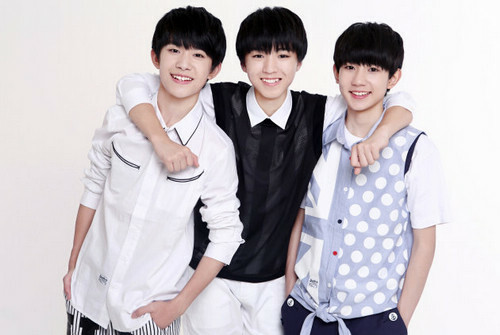 The group, known as the youngest pop band in the Chinese entertainment industry, consists of lead singer Wang Junkai (Karry Wang), Wang Yuan (Roy Wang) and main dancer Yi Yang-qian-xi (Jackson Yi). The eldest member, Wang Junkai, was born in 1999 and the other two were born in 2000. TFBOYS, who made their official debut in August 2013, gained great popularity on the Internet thanks to the strength of social media. They quickly topped China's music charts and have built a large and loyal fan base in Southeast Asia. Some of their representative songs include "Heart," "Start to Love," "Magic Castle" and "Go for Dreams." These are truly the most popular idol bands of all time in China, though some of them have been disbanded.